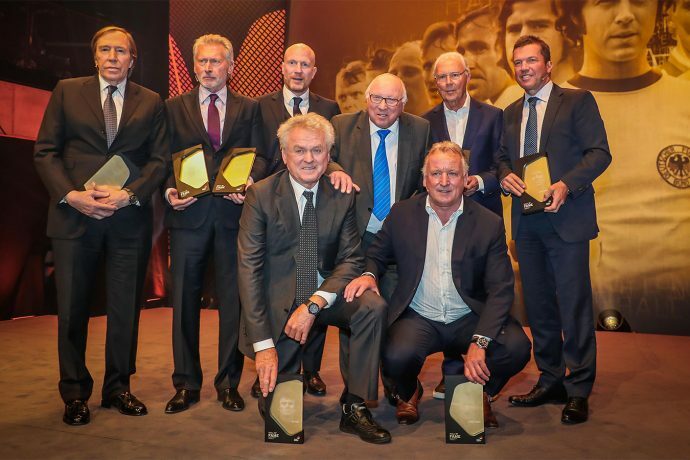 Eleven legendary players and a legendary coach have been inducted to the new established Hall of Fame of German football at the German Football Museum (Deutsches Fußballmuseum) in Dortmund. The induction took place as part of a glamourous gala event on Monday evening. Germany legends Franz Beckenbauer, Günter Netzer, Sepp Maier, Paul Breitner, Lothar Matthäus, Andreas Brehme, Matthias Sammer and Uwe Seeler were present at the entertaining and emotional function. Gerd Müller was the only member of the “founding eleven of the Hall of Fame” (“Gründungself der Hall of Fame”) who couldn’t take part for health reasons. Late Fritz Walter, Helmut Rahn and legendary coach Sepp Herberger were honoured posthumously. Belgium’s goalkeeping legend Jean-Marie Pfaff, 2014 FIFA World Cup winning captain Philipp Lahm, DFB president Reinhard Grindel, entertainer Thomas Gottschalk and famous German singer Mark Forster took care of the laudatory speeches, while the legends shared funny anecdotes from the their illustrious careers. Renowned figures from sport, politics and showbiz attended in the exclusive event including Armin Laschet, Minister President of North Rhine-Westphalia.